This is a completely new app that needs to be downloaded. All of your previous purchases are still available by syncing your account. 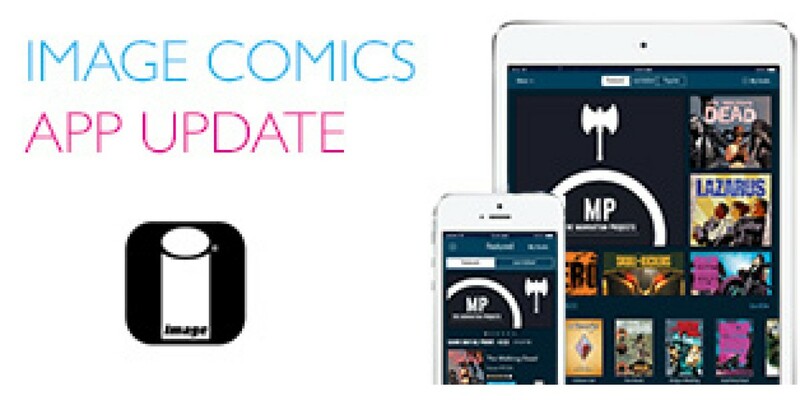 In-app purchasing continues to be available in this new Image Comics app. The new app features a robust update to the UI, embracing iOS 7. If you don’t have a comiXology account, go to comiXology.com to create one, or create one in the original Image Comics app. In the original Image Comics app, log into your comiXology account. Sync your in-app purchases to your account by tapping the Restore button on the Purchases tab. Download the new Image Comics app. If you have comics downloaded in the old app, no problem! You can continue to read them there without re-downloading to the new app. No need to redownload into the new app if you don't want to. You can download the new app by following the links within the original app that are available, or installing it from the iTunes app store. If you have any issues with syncing your account or accessing your past purchases, comiXology support is available to help by contacting comiXology via e-mail or comiXology Support on Twitter.